When I was in Bloomington-Normal, IL in November, I stopped by their local NPR affiliate WGLT to record some more poems for their show Poetry Radio. Yesterday my poem "Panoramic View" from Brink was the poem of the week. I don't know how many more they will run, but I think I did ten this time. 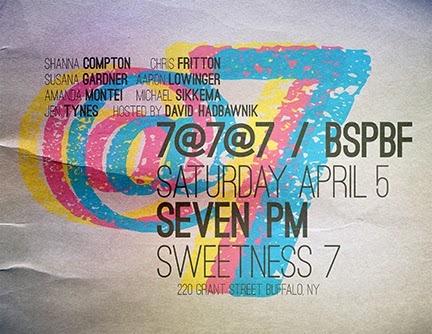 Next month: CUNY Chapbook Festival & the Buffalo Small Press Bookfair! Four independent publishers discuss both traditional and innovative forms of chapbook publishing, including digital and PDF formats, alternative and mixed media, and expanding the idea of the chapbook to include fiction, nonfiction, and cross-genre work. Publishers will also offer advice on how to prepare and submit your work for print, resources for publication, and how to do it yourself. Featuring MC Hyland, Shanna Compton, Adam Robinson, and Bianca Stone with Melissa Faliveno as moderator. The panel has an event page on Facebook. The full festival schedule is here. I'm excited to be going back for this great book fair in Buffalo too, which I really enjoyed last year. You'll find me at the Bloof Books table Saturday and Sunday, of course, but also participating in this reading on Saturday night. This reading has an event page at Facebook. Read more about the BSPBF (and find a full schedule of events) here. The book fair is Saturday and Sunday, but there are other events on Thursday and Friday. This book fair is much less intense (in a good way) than something like AWP, and also includes a few short book arts workshops. I picked up a few hand-printed tee shirts, letterpress stationery, and other DIY goodies last year, in addition to the books and chapbooks I bought and swapped for. The BSPBF is free to attend, so I highly recommend making the trip if you can! We'll have new books, chapbooks, and broadsides for both of these too. Can't wait.